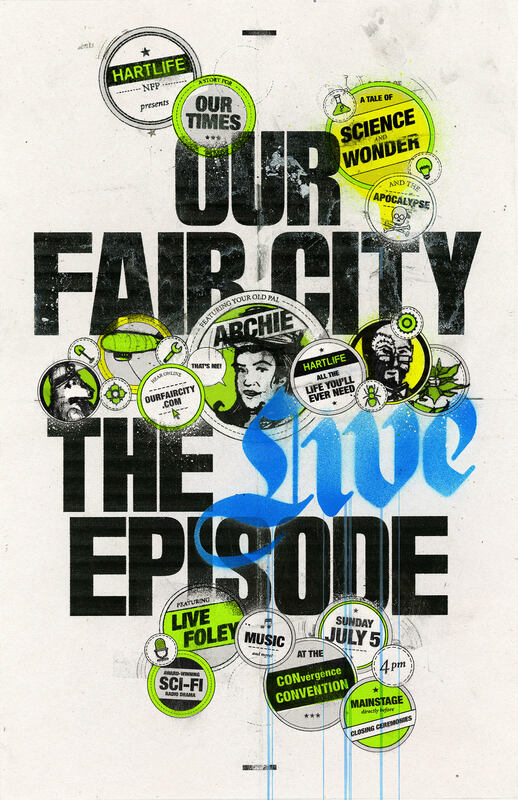 Season Seven of Our Fair City is Coming! Loyal Policies: we will be launching Season Seven of Our Fair City on May 21, 2016. 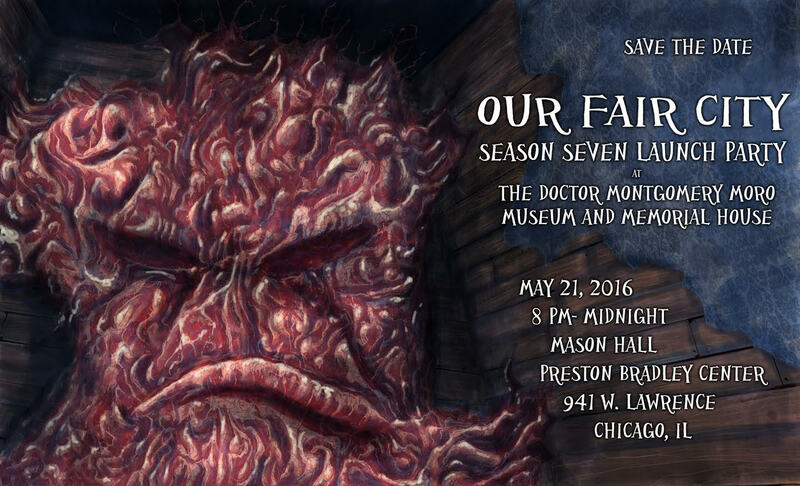 Subscribe here to make sure you don’t miss it, and join us at the Season Seven Launch Party in Chicago, IL to help us kick off the new season! Stay tuned here, or on facebook, twitter, or tumblr for more details coming soon! 941 W Lawrence, Chicago IL. The spacefaring adventurers of Improvised Star Trek have returned for a LIVE run at iO! For one night only, HartLife NFP will be their opening act. Our policies promise to thrill and chill with an ALL NEW production set in the universe of Our Fair City. Please join us for “Tidings of Comfort and (Mandatory) Joy.” You’ll delight in 5 traditional holiday songs that have been re-tooled to suit the post-apocalyptic, wintery wastes in which we all live. Ho, ho, ho!! Tickets are just $14. So please, loyal policies- come fill the room with festive cheer! …Those who do not will be put on a festive list. 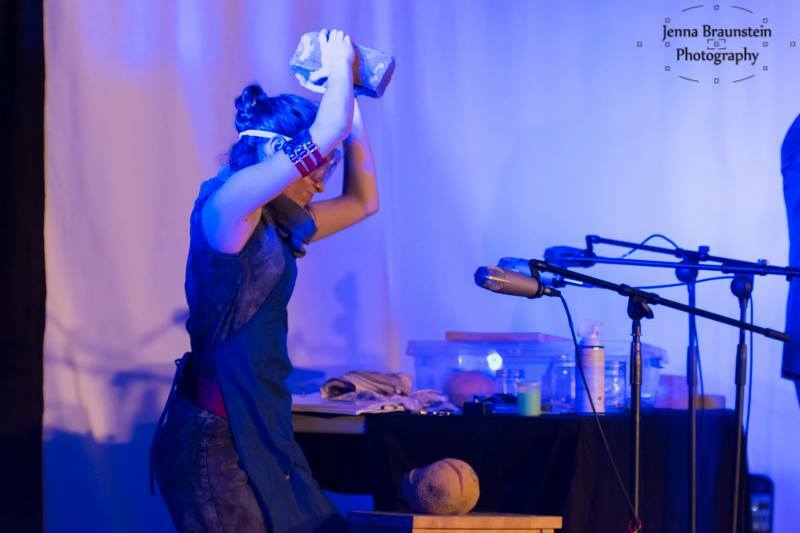 Founded in 2011, HartLife Corporation, NFP is an audio drama production company whose mission is to engage audiences by building rich, immersive worlds with imaginative, thought-provoking audio drama, supported by art that stimulates all five senses. 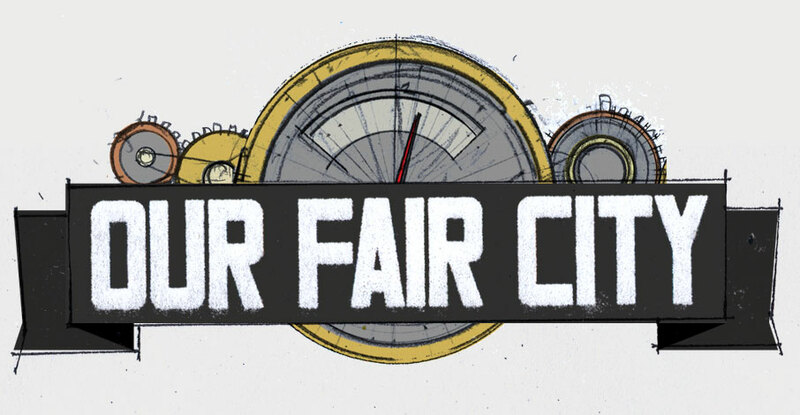 Our flagship production, Our Fair City, has won multiple awards for quality in science-fiction audio drama and has gathered a large following across America and the world. We are seeking a Show Runner for a new flagship audio drama to begin pre-production in 2016. The content, format, and release schedule of the show will be determined by key members of HartLife’s creative team in conjunction with the new Showrunner. In conjunction with the Executive Producer, the Showrunner is responsible for the creative direction of the production, including tone, plot, setting, and the release format of the audio drama. The Showrunner will also be responsible for coordinating visual art, live performances, and other media to support the audio drama with substantial support from HartLife staff. The Show Runner will be developing this new production from concept through completion. The show concept will be developed based on creative submissions from the HartLife community, with support from HartLife’s leadership team. The time commitment for this position is significant, and so is the degree of creative control the Showrunner will have. In addition to the qualifications listed below, it is critical that the candidate be able to take initiative, motivate others, and set a clear direction for the production and the company. The Showrunner role is distinct from the role of the Head Writer, Director, and Executive Producer – though it is possible that the Show Runner will fill one of these roles as well. Loyal Policies, we are proud to announce the official times and dates for our newest live show at the 2015 Chicago Fringe Festival! Featuring Abby Doud, Jared Latore, Stephanie Murphy, and Clint Worthington, with live foley by Ele Matelan, and music by DJ Catnip with music direction by Betsey Palmer. Loyal Polices: we have some incredibly exciting news. After a lot of careful discussion, the HartLife creative team has decided to re-write, re-record, and re-design Season One of Our Fair City as a single stand-alone episode. After months of work, we are absolutely thrilled to share it with you. We’ve decided to do this for a number of reasons. Season One represents the very beginning of our learning process. In the writers’ room, we’ve learned a lot about crafting a compelling story using audio alone. In the studio, we’ve learned an incredible amount about what makes good sound; our first season was recorded in a closet (literally) with a popscreen made from pantyhose and a coat hanger. And in our lives, we’ve all grown as people. In some cases, our past work tells a very different story (and reinforces different cultural narratives and norms) than we intended. As the artistic and administrative team has diversified, in terms of gender, race, sexuality, gender expression, and more, we’ve all had the opportunity to re-examine what we were saying with our first season. We are proud of all the work we’ve done, but we felt the time was right to revisit this early work. What you will hear is our best foot forward, driven by everything we’ve learned personally and professionally over the last five years. With Season One Revisited we have been able to communicate the original story of Neal Henderson, Elizabeth Rourke, Alison Dalton, and Nathan Rourke in a way that is truer to our intentions, approachable for new fans of the show, and exciting for our long-time listeners. If you’ve always wanted an easy ambasador piece to get your friends listening to the show, this is it! We are incredibly thankful to the actors, writers, visual artists, and others who worked on the original Season One. It is important to us that their work be recognized, and that fans of the show can see where we started, and what we have grown into. The original 14 episodes of Season One will remain on our website, freely available to stream or download as always. We are so very pleased to announce that this summer, Our Fair City will be returning to the CONvergence convention in Minneapolis, MN over the fourth of July weekend! We will be hosting several panels on audiodrama, post-apocalyptic storytelling, and arts management throughout the weekend, as well as hosting another open call recording session for crowd scenes! Consult the Programming guide for more details. Join us at 4 pm on Sunday, July 5th (directly before closing ceremonies)! Want to come work with an awesome group of dedicated artists and administrators, spreading the good word about HartLife and supporting the Our Fair City Audiodrama? We’re looking to add a Merchandise and Sales Lead to our team! If interested, please send your resume and a few words about why you’d like to work with us to [email protected]. The Merch/Sales Lead will head up all Merch and Sales Related activities, making Our Fair City merchandise available to the public through both a webstore and at merch tables at our live events. We want someone who can take the strong visual and aural aesthetic of Our Fair City and get it out into the world through t-shirts, comics, prints, or any other way you can imagine! We’re looking for someone who can craft a line of merchandise that people will love, and want to snap up as soon as possible. Design/Ordering: Collaborate with Visual Arts Director to design and order merch. Inventory Tracking: Keep up to date inventory on all merch in stock. Tracking/Reporting Sales: Keep records of sales made to report to Finance Officer. Analyze sales to advise on future merch inventory purchases. Set financial goals for company to meet through merch. Online Sales: Establish (in collaboration with Visual Arts Department and CTO), online store. The Merch/Sales Lead will be responsible for both Webstore Maintenance- keeping products up to date, adding new products, and managing order fulfillment (with assistance from other HartLife staff if necessary). Working Merch Table (Live Events/Shows): Develop best practices for working Merch Table at Live Events/Shows. The Merch/Sales Lead will be responsible for working the table or recruiting, training, and scheduling volunteers from within the company to work the table at events (Currently, approximately 4-5 events/shows per year, including a runs at the Chicago Fringe Festival, Launch Parties, conventions and other events). Additional Projects: Help to develop and run additional sales projects, in collaboration with company and Fundraiser. Experience working with Inventory and Sales desired. Experience with online stores and inventory management strongly desired. 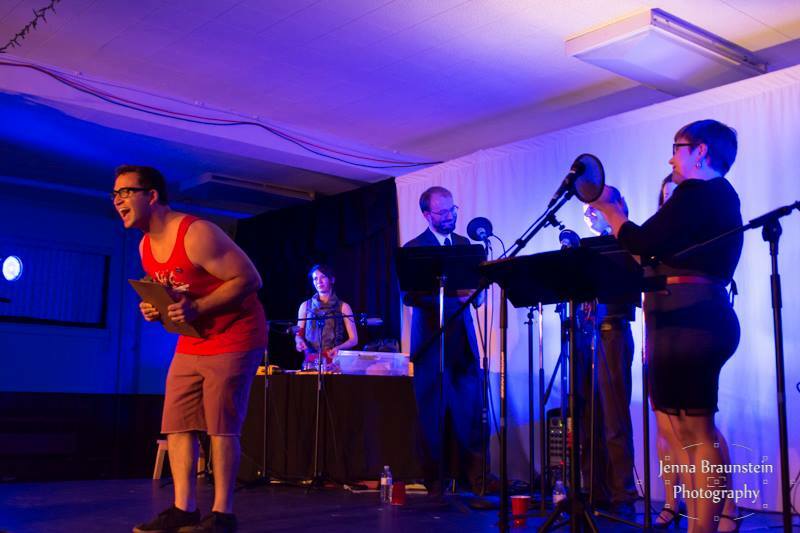 HartLife NFP Returns to the Chicago Fringe Festival! The Directors are very excited to announce that HartLife NFP will be returning to the Chicago Fringe Festival this year, presenting an all-new live episode of set in the world of Our Fair City! We are also excited to officially announce that this new piece will be co-written by none other than Our Fair City’s Kat Evans and Ele Matelan, and directed by HartLife and Fringe regular, Jennifer Olson! We hope you’ll join us in September for another great year at the Fringe Festival: stay tuned for more details. 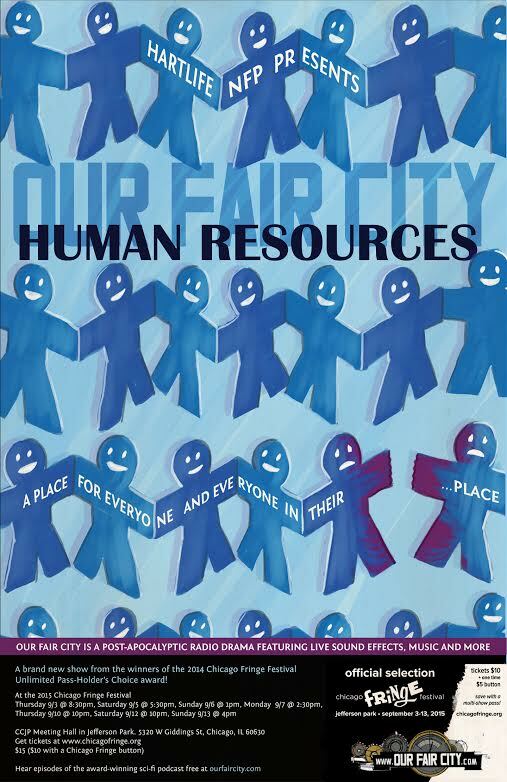 HartLife NFP is seeking a director to lead the production team for a brand-new live show set in the world of Our Fair City, to be performed at the 2015 Chicago Fringe Festival. This show will have a 7-show run between September 3rd and 13th. The show will be staged as a live audiodrama, though we welcome creative or unique interpretations of the medium. As a part of the collaborative team, the director will work with our writing team to develop the show between April and July. Rehearsals will begin in August. There is a small stipend attached to this position. To be considered, please submit a resume to HartLife NFP Executive Producer Jeffrey Gardner at [email protected] by 3/25/2015. Interviews will be conducted by phone or in person in the weeks following. We regret to inform you that HartLife NFP will not be able to attend the ChiFi 2015 convention this weekend as previously hoped. We sincerely apologize to fans who were looking forward to seeing us there. We will have more information soon regarding opportunities to see the artists behind Our Fair City live and in person (who we can assure you are alive and well and were NOT deliberately infected with a new strain of rat flu. We promise).